Textures are an important part of the materials that make up the final scenes in your games or still renders. It is possible to make your own textures using your own photos and some Photoshop magic, but it is almost always easier to find a repository online to get your textures. This is especially true if you don’t have access to a good quality(and often expensive) camera. Below is a comprehensive list of sites where you can & download good textures. Most of these sites have a mixture of both free and higher-quality paid textures, but you can use all of them in your projects. The licencing is usually very lenient as well which allows you to use them on both personal and commercial projects. 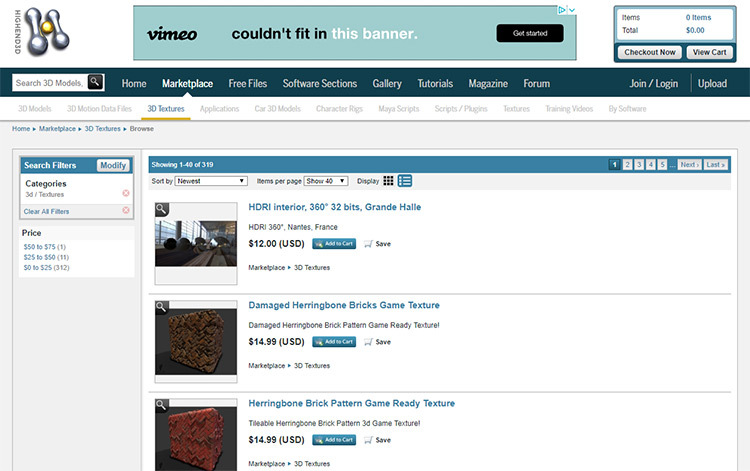 Textures.com is probably the largest texture library on the web. You may know it as CGTextures which only recently changed it’s name over to the much simpler Textures.com. But they’re the exact same website. It has its textures broken into categories and then subcategories so it’s super easy to find whatever you’re looking for. There is even a search function if you’re looking for something really specific and all textures are tagged so they’re easy to find. Most textures on this site are completely free as long as you’re happy with low resolutions (around 1k) with higher resolutions costing credits. Credits are the premium system this site uses. You purchase credits then use them to buy higher resolution textures as needed. 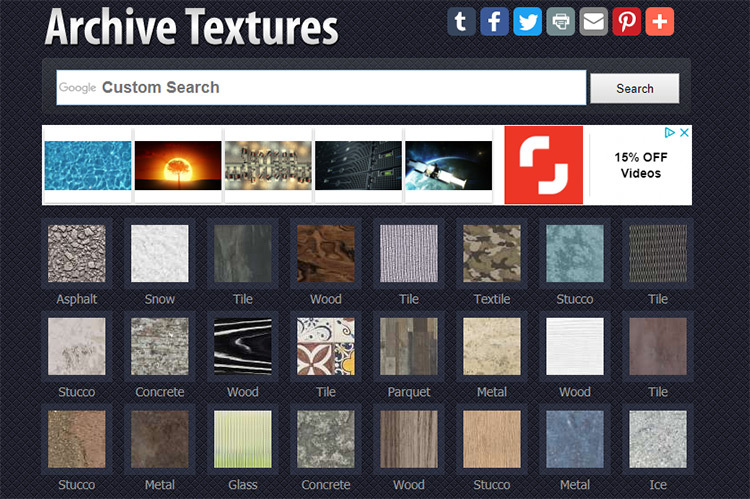 Texture Haven is another popular site to get 3D textures from. It was formed by a 3D artist from the Netherlands who uploads all of the textures he creates for his work, all for free. The advantage of this site over Textures.com is its textures are all high quality and it doesn’t cost anything extra to get up to 8k resolution. However the size of this site’s library is quite small due to the higher quality it commands. There is a sister site accessible from the top navigation bar called HDRI Haven. This site runs the same way, offering huge resolution high quality HDRI textures for lighting your scenes. And once again, it is completely free! 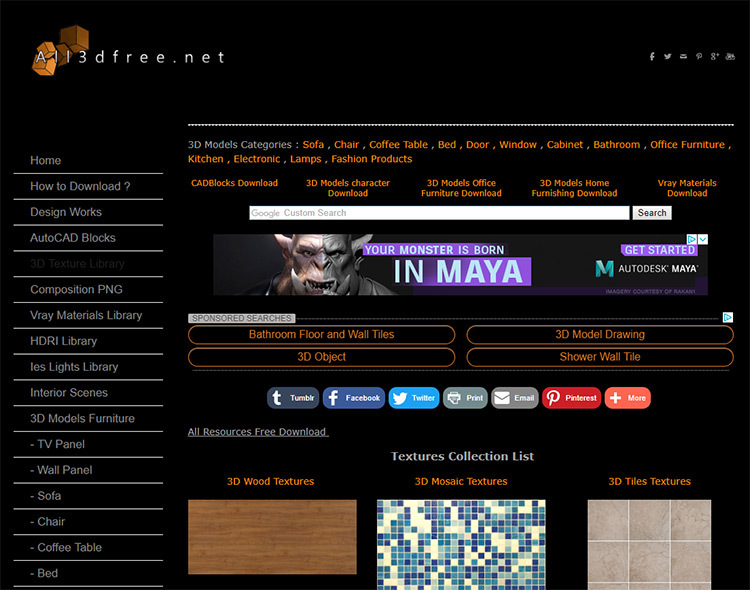 3DTextures is another site that offers all its content for absolutely free at 1k resolution. It also has some of its content as Substance Designer files so you can download them and make your own tweaks to get some incredibly unique textures. This site has its own subreddit and Discord servers so you can talk to the creators and ask them any questions you may have about their work. 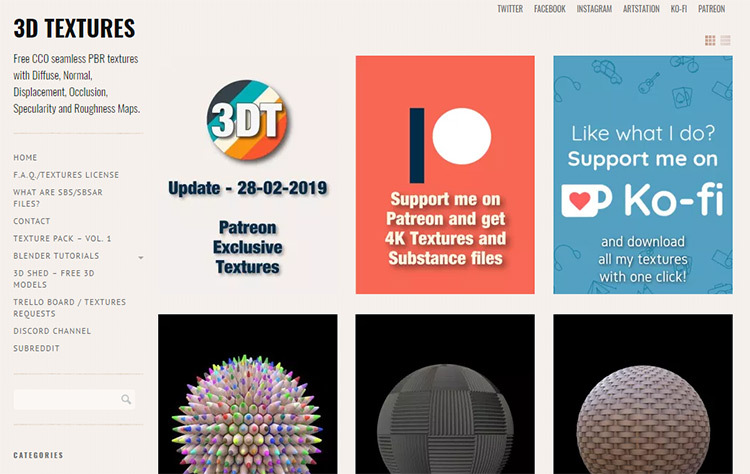 If you want higher resolution versions of their textures (4k) and access to all the Substance Designer files you will need to join their Patreon ($5 a month tier), or a one off payment of $30 on ko-fi for permanent access to all current and future textures. Poliigon is a premium texture site with plenty of variety to pick from. Its library is very large and covers a lot of categories but you need a subscription to get the credits needed to download anything. A subscription is $12 a month for a hobby licence(100 credits a month) moving up to $35 a month for a studio licence(600 credits a month). Something you need to bear in mind if you buy the hobby package is that you will not have the license to use the textures commercially. You can just buy credits as a single purchase, though these are generally more expensive. For this price though you can download textures for anything up to 8k resolution and they offer all the supporting textures you will need to make a full material in almost any software (normal, height, specular etc.). As the name implies, All 3D Free offers all its content for free. You don’t even need to register an account unless you want to upload and share your own work. The texture library on this site is quite large; however like most of the free sites on this list, the texture sizes are usually fairly low resolution. They also only offer the diffuse/albedo maps, meaning you will have to make your own normal maps and other supporting maps. This site offers a lot of stuff other than just textures though, like people cut-outs for post-processing your renders and even some free 3D models that you can use in your scenes. 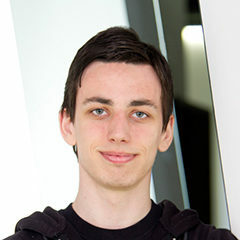 This website (based in Germany) is another that offers its textures for free, but again, at a lower resolution. They also do not come with the other maps you need to build a full material, just the albedo channel, but there is a lot to choose from that can provide some use. 3DXO also offers some free models that you can add to your scene which is a nice added touch. It’s worth noting the licences on any of the materials you download here. Some are free under Creative Commons meaning you can use them commercially, but some are only for private use. This is clearly stated on each of the texture’s individual pages. Archive Textures is a very basic looking site but it is packed with content. This site also offers all of its textures totally for free. They are available in all sorts of resolutions(up to 8k) but it depends entirely on the individual texture. So you’ll have to do some fishing here. This site only offers the albedo maps, but the fact you can get such high quality resolution textures for free is great. This site does use categories but even so it can be quite hard to browse and find what you want. It also has no way of displaying or sorting by image resolution until you are at the download page. This can make finding certain textures quite frustrating and it feels like sifting for gold. Although if you keep digging around you will definitely find some gold. Founded in the year 2000 and used by companies all over the world, almost every 3D artist knows about Turbosquid. But did you know it has a textures section? Like the rest of the sites in this list, its content ranges from free to hundreds of dollars. You can easily sort by price to see what’s in your price range and find what you can work with a little faster. The textures here also vary in resolution and quality based on the author of the work, same with the price. Some are even full materials packages that include your normal maps, specular maps, and many others. 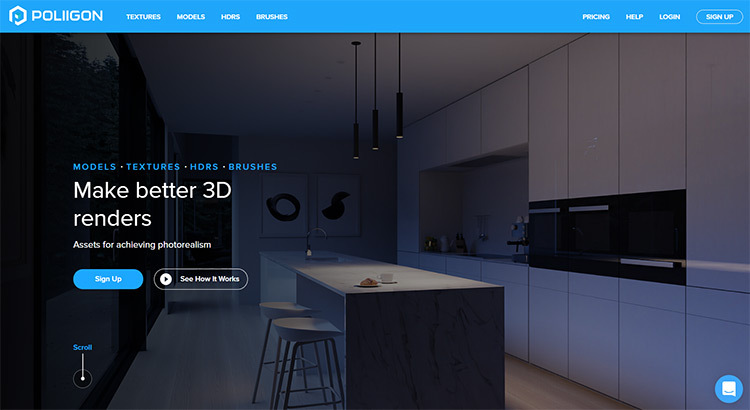 We mentioned 3D Total before in our list of best 3D websites. 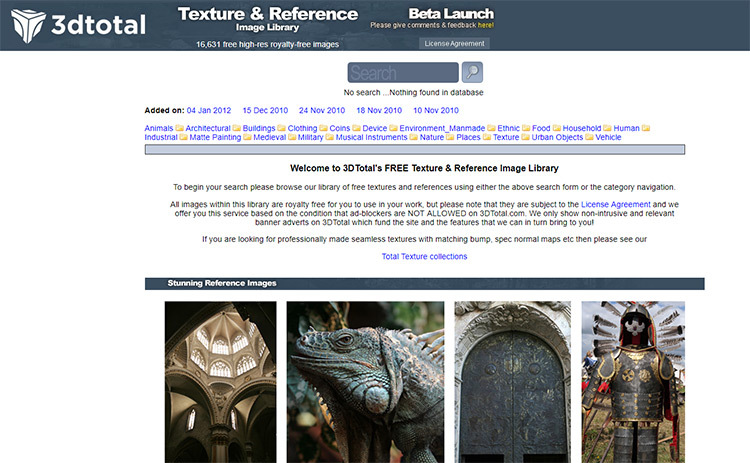 But they also have a section of free textures for download, specifically made for 3D artists. This section of their site is full of different textures and reference images with the site boasting a total of over 16 thousand! 3D Total offers all of its photos and textures in their original resolution which usually averages about 4k. However most of its images are more for reference purposes, with its texture library being relatively small compared to others on this list. All the images are completely royalty free meaning they can be used in commercial projects with no issues. 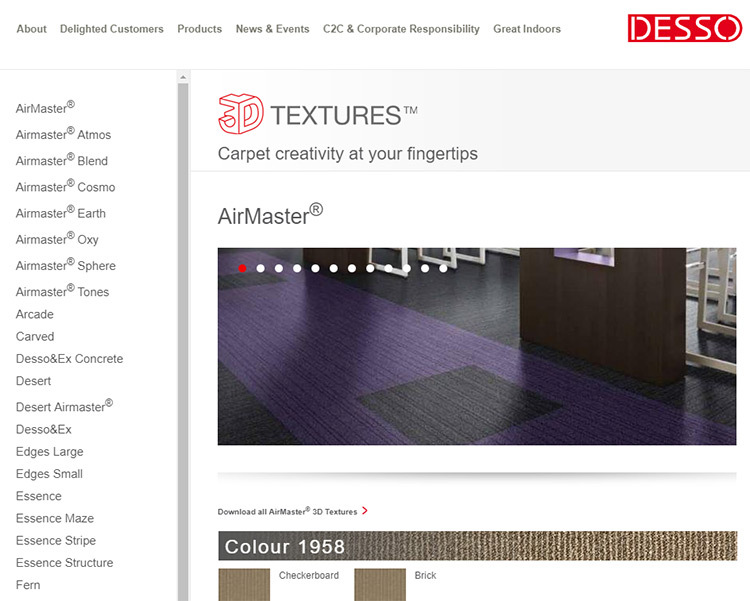 Desso is an interesting site as they are not a company that specialises in 3D; they are actually a flooring company. They do, however, offer textures for all their products for interior architectural visualisation renders. Their range of carpeting textures is massive. There is more here than you will ever realistically need. You can download low res versions of their textures for free(700x700px) or a single tile that you can then use to make a high res texture on your own if you add your own variation in Photoshop. To download their full high resolution textures you have to register an account with them under a company name. Although this site has SketchUp in the name, that doesn’t mean these textures are only available for that software. They can easily be used in your preferred 3D package. 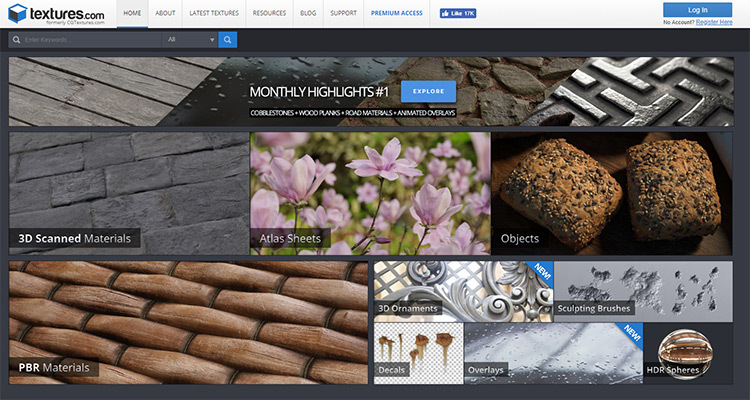 This site has a good collection of textures and is another site that offers a premium option. If you create a free account you can download any of the albedo maps for free at 1k resolution. Premium club members get a higher resolution texture and all the maps you need to build the full material. The price for this upgrade is very reasonable at only $13 a year, which allows you to download 50 textures every day. The textures are all royalty free so they can be used in commercial projects too. 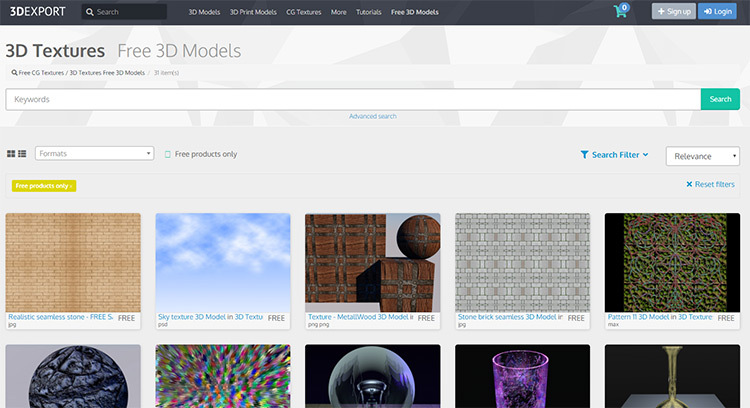 CGtrader is another popular site that 3D artists and companies use to buy and sell assets. The prices of the textures and materials here range from free to more expensive higher quality textures. You are given plenty of filters so you can search based on price, or ratings, or both! Most of these come as full materials giving you all the maps you need to make a complete texture in whatever software you wanna use. 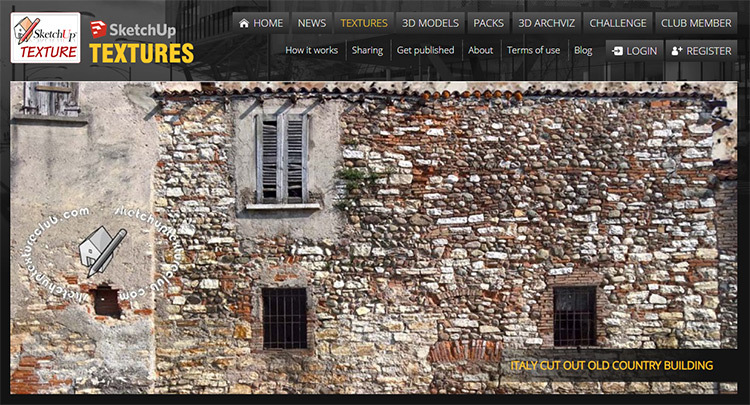 Here’s another fantastic site that lets you buy and sell 3D assets, including textures and materials. All focused on 3D artists. Some of the content here is available for free, but generally you’re going to have to pay a little bit if you want the best textures from this library. 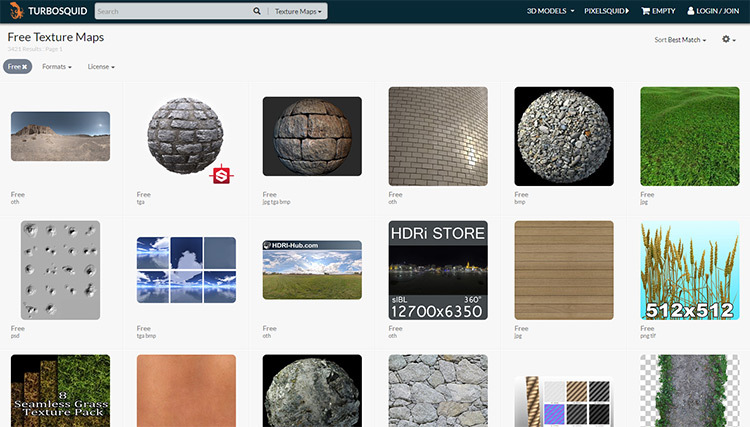 Like similar texture sites, 3DExport has a lot of sorting options making it easier to find materials based on your budget and your project needs. Highend3D is yet another website mentioned in previous articles we’ve published. 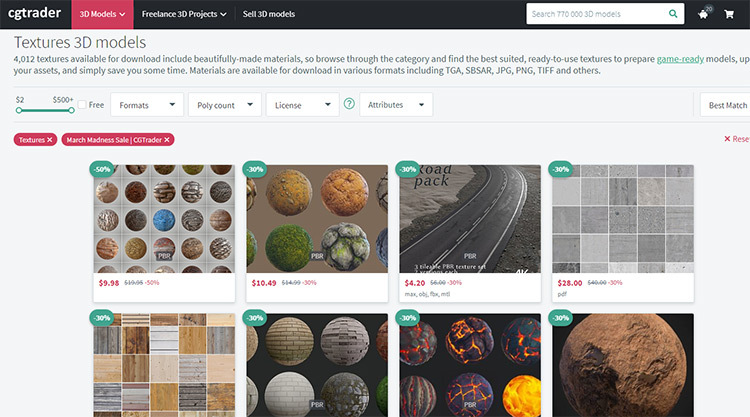 It’s a marketplace that contains a large number of materials and textures for 3D artists. This is the only site on the list that has no free content. Everything comes at a premium price tag here (lowest starting at $3). But all the textures on here, as the sites name suggest, are of exceptionally high quality and would sit well in even the most professional scenes. If you’re in a crunch period for a high profile project and need some good materials quickly, this may be your best option. Hope these websites help you find all the textures you could ever need! Also a tip for the sites that only offer albedo/diffuse maps: specular maps and similar grayscale maps can be easily made in Photoshop by adjusting the saturation and contrast; however normals are a bit trickier. Nvidia has a great plugin for Photoshop that makes normal maps from regular bitmaps. It’s absolutely free and can be downloaded here. I hope you all have fun making slick materials from the massive range of textures out there.